The Independence Day holiday wasn’t exactly a day off for New Beginnings Church of God in Meadville, Pennsylvania. While July 4 doesn’t have the same ring in other countries as it does in the USA, it’s an opportunity for domestic outreach that’s hard to resist. The freedoms we have in America certainly pale in comparison to the freedom we have in Jesus Christ, but on July 4, New Beginnings demonstrated gratitude for all the blessings God has given. They wanted to show, in particular, that God’s love for them overflows into love for their neighbors. So after options for family-friendly fun on the Fourth of July all but faded from the community calendar, the church stepped up to the plate. Reviewing all that the Lord has done since to cement the church’s relationship with their community, they’re glad they did! A day of festivities and fun culminated at New Beginnings Church of God on July 4, 2016, with a professional fireworks show and up to seven thousand guests. That’s way up from last year, when roughly three thousand from the community attended the event. Maybe they’d previously thought, Will it really be any good? We’re talking about a church putting on a fireworks show! But in a town of just over 13,000, word gets around fast. The Ultimate Freedom Event was no misnomer. 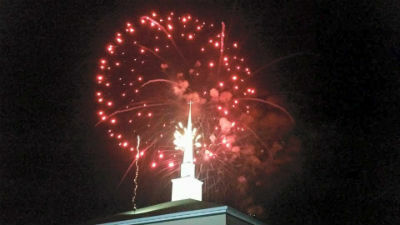 When New Beginnings Church of God said they would be putting on a good fireworks show, they meant it. Up to ten thousand fireworks made for a spectacular show that delighted both kids and adults. Photo: Crowds enjoying the festivities at New Beginnings. It takes months of preparation, if not a year, to pull off such a large-scale feat. 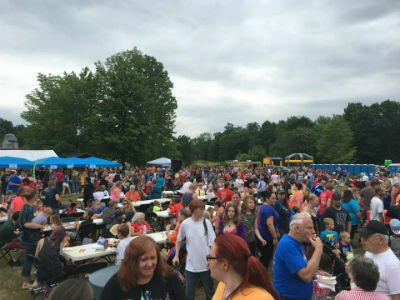 Live entertainment, a car show, 5K race, three-on-three basketball tournament, petting zoo, corn hole tournament, and children’s “fun zone,” in addition to a professional fireworks display, takes effort, resources, and time. But for the impact the church had on the families of Meadville this Independence Day, it was all worth it. This entry was posted in All Church of God, Northeast and tagged Cliff Forbes, community, fair, festival, fireworks, Fourth of July, Independence Day, July 4, Meadville, New Beginnings Church of God, outreach, PA, Pennsylvania. Bookmark the permalink.